Even at a young age, that sort of attitude towards waking up seemed implausible. I can’t remember ever greeting a new day with a fist pump and a smile. For me it is more like opening one eye, and hoping I’m dreaming and the alarm is not going off. One very fine thing about retirement is that most mornings, no alarm needs to be set. I can mellow into the morning, thinking about this or that. Often, it is one thread in that train of thought that inspires me to get my feet on the ground for another day. The other morning, I can distinctly remember what that thought was. So I got up and checked the hummingbird feeders before I did anything else. 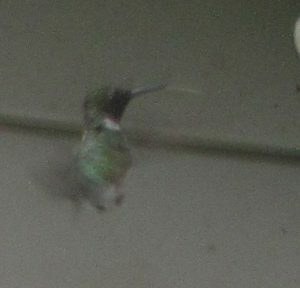 This year we have been blessed with humming birds, who are my favorite summer birds. 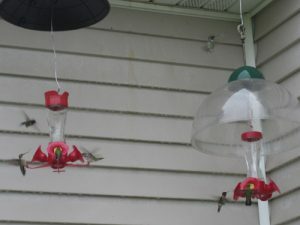 I maintain 4 feeders that are placed outside windows on 3 sides of the house. Two of the three sites are effectively defended by birds that allow few incursions into their territories. The third site is outside the kitchen window, and I’ve found I need to keep two feeders there, because it gets the vast bulk of the hummer visits. If there is a bird defending this site, he must have thrown his wings up in the air long ago and allowed pandemonium to reign. It is hard to get an accurate count, but we believe we’ve seen 12 birds at one time at the feeders by the kitchen window. That coupled with the wasps that also lay claim to the feeders, and the excitement is palpable. Alice commented that the designers of the Harry Potter ™ game of Quidditch must have spent time watching humming birds jockeying for position at their feeders. If you look carefully at this blowup of the little male in the upper right of the picture above, you might be able to see his tongue is out. By now, most of the males have departed for warmer climates, and it won’t be long before the last little female leaves us for the jungles of Mexico. Until that time, we’ll have the pleasure of looking out the kitchen window and smiling at our little buddies. This entry was posted on Friday, August 10th, 2018 at 9:54 pm and is filed under Uncategorized. You can follow any responses to this entry through the RSS 2.0 feed. You can leave a response, or trackback from your own site.